Russian President Vladimir Putin warned against U.S. military action against Iraq, saying that the situation in the Persian Gulf nation was different from Afghanistan and that only the U.N. Security Council could sanction any attack. In an interview published Monday in The Wall Street Journal, Putin called his nation's partnership with the United States the key to stability in the world. The two powers have reached a "new level of trust," he was quoted as saying. "This trust allows us, despite any differences or arguments on specific issues, to avoid confrontation," Putin said. Putin was the first world leader to extend condolences to President Bush after the Sept. 11 attacks, and he has been a supporter of the U.S.-led anti-terrorism campaign in Afghanistan. However, Russia is Iraq's closest ally in the United Nations Security Council, and Moscow has frequently tried to end the U.N. sanctions that were imposed after Iraq invaded Kuwait in 1990 and protested U.S. and British airstrikes. In the interview, Putin objected to Bush's inclusion of Iraq, Iran and North Korea in what the U.S. president called an "axis of evil" in his Jan. 29 State of the Union speech. Numerous U.S. officials have suggested that Iraq could be next on the list of countries to be attacked in the anti-terrorism campaign. 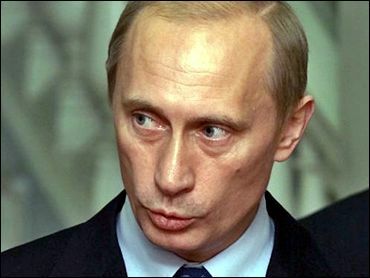 "We oppose the drawing up of black lists," Putin told The Wall Street Journal. He admitted that Iraq presented a "problem," but said, "Such problems cannot be solved by one country alone." In the interview, Putin also said that Russia, one of the world's largest oil producers, favored a per-barrel price of $20-25. He also defended the criminal cases opened recently against prominent Russian business executives  which some in the business community have called politically motivated  though he allowed that prosecutors and police sometimes make mistakes. "Naturally we have to improve the activity of our law enforcement authorities but the worst way of improving their work is to block all action," Putin said.